I use the LeClerc storage bobbins also. 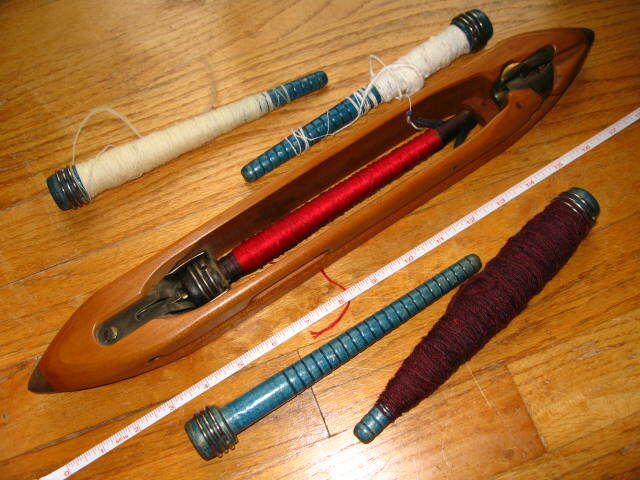 They are also helpful if you have one bobbin spun that I you want to ply. 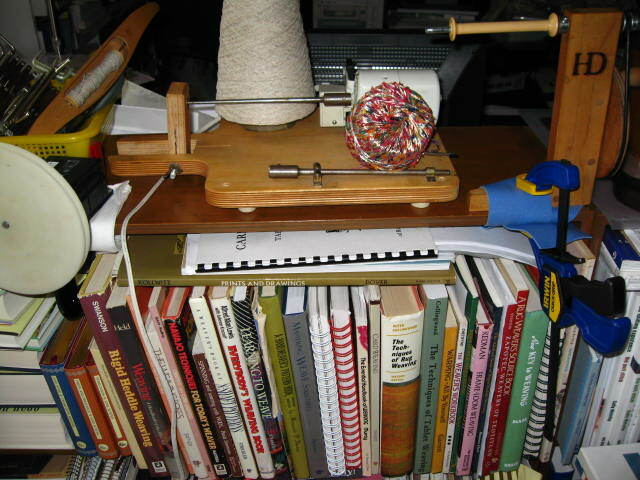 I thread the yarn through my yardage counter, wind it all onto a storage bobbin. Then I see how many yards I have, divide in half and wind that amount from the storage bobbin onto a second storage bobbin. 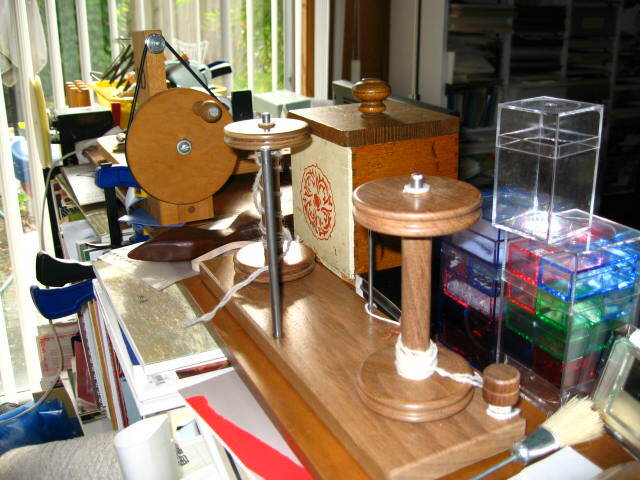 I have used my electric bobbin winder for winding onto a storage bobbin. It works pretty well if the the spun yarn is strong. 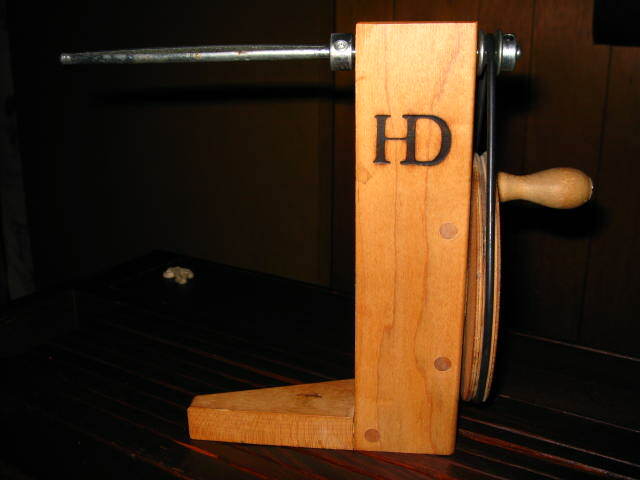 But I was having some trouble with weak spots, so now I use my good old Harrisville bobbin winder for that. Oh yes, Peg! Thank You for reminding me of the other great plus of winding off onto storage bobbins — used with a yardage counter (mine is the white wheel thing in the pics above) — it’s a great way to have matching lengths on all the bobbins so the singles come out even in the ply. Thanks for all the info. I talked to someone who said that she sticks to the plastic storage bobbins, as the wooden ones produce too much “drag” on the electric winder and it gets too hot. Have you found this? Suzan, having a lot of bobbins has truly freed me to play and sample as much as I’d like! 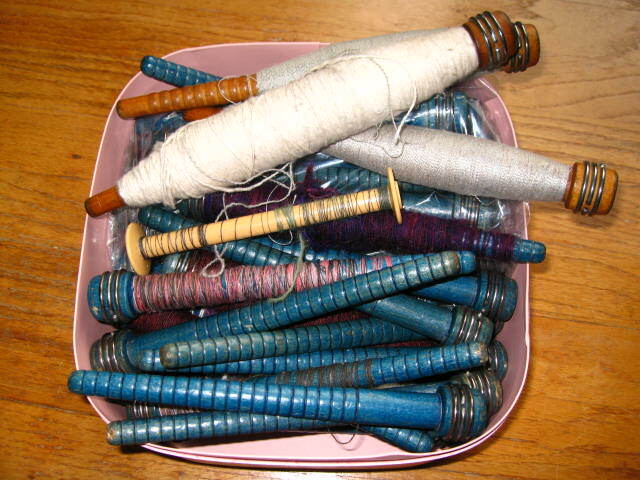 Even though I’m no-where close to running out of bobbins yet, I’m toying with the idea (I forget where I read it) of keeping one large bobbin for appending any singles that I might not use again — to eventually have something to turn into novelty yarn, like wrapping around cores, etc. Lynn, I’ve only wound the plastic Leclerc bobbins on the electric bobbin winder so far. I’ve wound quite a few pirns on the HD manual winder (sometimes I need to insert a little paper to make them fit more tightly on the winder), and I haven’t noticed any more drag than when winding the Leclerc bobbins. 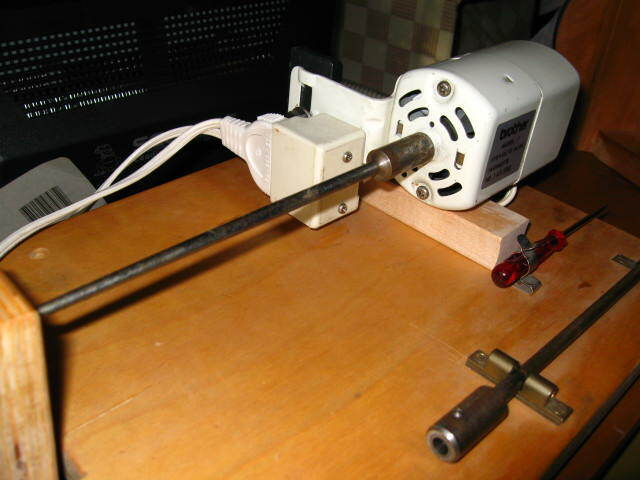 I haven’t used any other electric winder, so I can’t compare, but the electric motor is so powerful, I highly doubt the pirn would put much (if any) drag on it — on my electric winder, anyway. The only drag on the motor has been by me, as I struggle to keep up with winding on evenly — I think the much-needed dimmer switch would eliminate that problem. Though most of this is Greek to me, I enjoy hearing your thoughts in any language. And I love your pirns! That is my favorite blue! Hi, If you have a hardware store (or we got one at Ikea) you can get an extension cord with a regulator high/low(dimmer) switch in the middle of the cord! If you plug that into the end of the electric winder, then plug that end into the wall, the little slide on the cord will slow down/speed up the winder! You don’t have to do any fancy wiring or know anything electrical. We got one in our bedroom b/c DH liked to stay up and read, and I like the light off, the dimmer on the cord keeps us both happy and I think it was 7$. Good luck!! Julianna, I’m so glad not to have to mess with any wiring. What a great idea — Thank You so much for the tip! 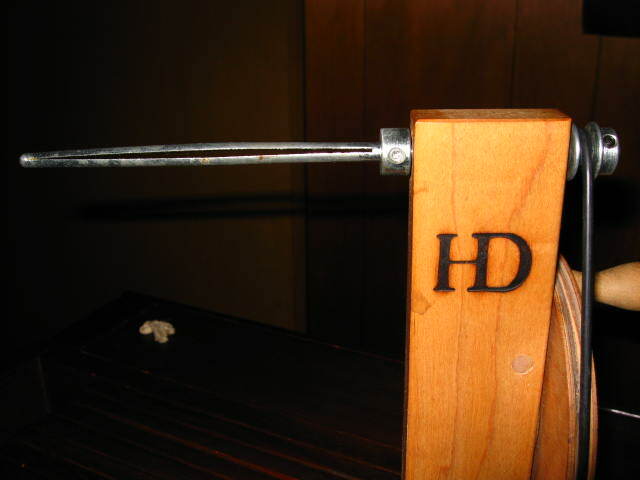 Can you tell me where you found the Harrisville manual winder? I’ve been searching for a manual winder that is well-priced and can’t find anything under $100! I got my first one from eBay; the second one I got on Craigslist. I know there are metal manual winders available for less than $50 (including shipping from Europe) on eBay. Thanks! I saw some metal ones on e-bay, but was hoping to find one like yours. Seems like a hard find, though. Thanks again for your response – I appreciate it and your informative post. Hello. I feel like you and I are connected! I love the way you relate to us with your words. It’s me too! LOL. I stumbled upon your blog because I am currently addressing my spinning skills. I have spun for 7 years and want to improve. I am really hooked into Judith Mackenzie. I like her gentle demeanor (which you seem to have as well!) and affection for spinning. You mention in your article about transfering the singles off to another, which I gather you got from her. It sounds so logical. You made mention of the adding or subtracting from the original singles twist by the way you wind on to the new spare bobbins. Will you elaborate? I am on to a discovery as some years ago, I purchased a tensioned lazy kate that enables one to ply 6 bobbin fulls together. They sit on a wood base in a circle. The singles feed through a hole into a center post and come out of that post together. I thought it would be a lovely idea. I tried it and used it for some time. However, I seemed to have trouble with my plied yarns. I couldn’t quite put my finger on it. Since I hadn’t been spinning everyday, I assumed it was me getting “back into” it. I was unhappy with my yarns. They seemed unevenly and loosely plied. I have many full bobbins of original singles that I intend for them to become a 4 ply yarn. The yarn will be 1 ply of cinnamon alpaca, 1 ply of black alpaca, 1 ply of morrit polwarth, and 1 ply of llama. I plied them together in the hopes to make a warm sweather for myself. Using that tensioned kate, I was dissatisfied with the resulting yarn. I am wondering if I lost the twists in the original singles. So, your article really interests me. I want to spread and even the original twists but don’;t want to enter more twist into the final plys. Is there a certain way to wind them onto a spare bobbin—– standing up or laying down? Will you share your discoveries with me? Hi Pam! Thank you for stopping by! I’ll do my best with your questions, but I’m not an expert, and if I write something incorrect, will someone else please help Pam out? 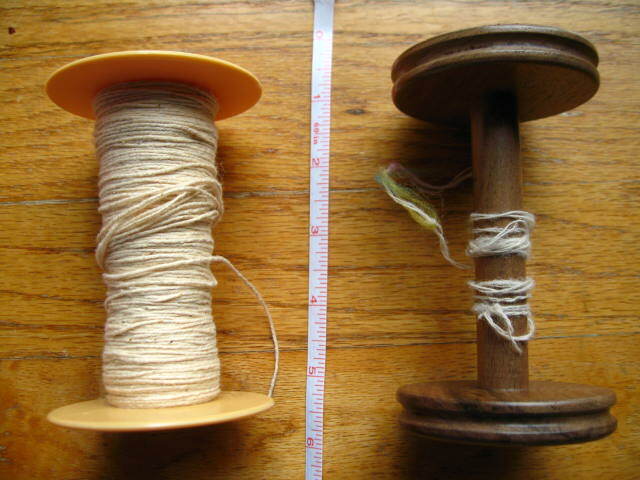 Even the way of unwinding singles from a bobbin affects the twist. Try out this experiment with a roll of toilet paper: when you unwind it from the dispenser, the paper roll rotates and when you unroll the paper off the side, it comes off the roll flat and untwisted. Now, if you take the roll of paper off the dispenser, set the roll on one of its flat sides, and pull the toilet paper straight up, you’ll notice that you have just added twist to the paper as you keep unwinding more paper. 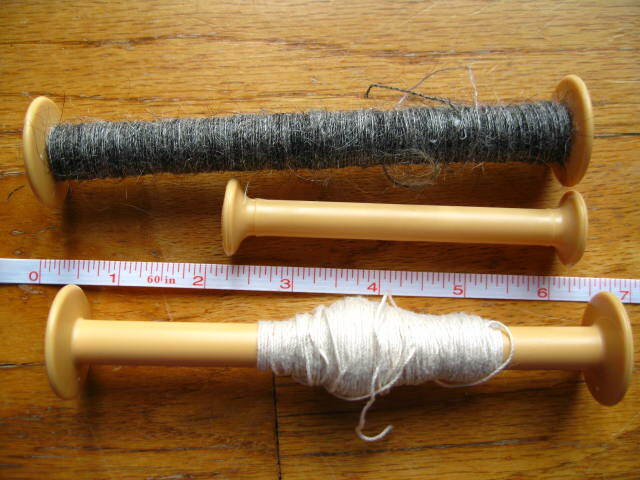 If your bobbins spin on the lazy kate, then you are not adding twist when you ply. 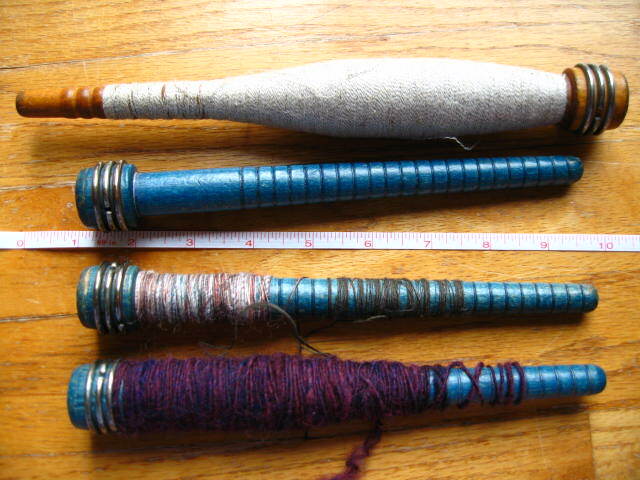 With my blue wood bobbins (they are more accurately termed “pirns”) shown above, the singles get added (or subtracted, depending on whether they were spun S or Z) twist because they unwind off the tip of the pirn. What I do when I want to add more twist to (or subtract twist from) a single, is put the bobbin of that single onto a kate, then respin that single onto a new bobbin on the spinning wheel. It’s a good idea to test your retwisted four singles by plying a yard or so, then taking that short length to the sink to wash under hot water. When that short length is dry, you’ll have a better sense of which singles need more adjustment. The way I even out twist without adding additional twist to my singles is to put my wheel (or kate) as far across the room from myself (in my case, it’s about 15 feet) as possible. I make sure I unwind the bobbin from the side (using the wheel, I release all brake tension), and I use a bobbin winder to rewind the same single from the side. This works best for freshly-spun singles, as that twist energy is still “live” and will re-distribute itself over the length of the unwound single. During the one class I had with JMM, she taught plying without tensioning the bobbins. One hand stays still, and keeps all the plies in order, while the other hand pulls the plies and feeds them toward the orifice. Your four singles sound heavenly! Best of luck with the sweater!